The format for the Men's Interstate Championships was again heats, repechages and finals. The closest race of the day at the Women's Interstate Championships was the Lightweight Four Championships with less than 2 lengths covering the three crews. It is interesting to note that the two Queensland crews contained the same personnel and that Shirley Graham competed in all three events. SA did not participate in any of the Women's Championships. This was a great race with SA narrrowly leading through the first 500 meteres from Tasmania. Tasmania then took the lead in the second 500 metres with SA and VIC in close pursuit. These three crews were level at the 1500 metre mark and SA made their move to lead with 300 metres to go. However Victoria, with a strong final spurt, took the lead and the Championship. Reg Free won his second title in succession some 6.2 seconds in front of Norm Talbot of SA. 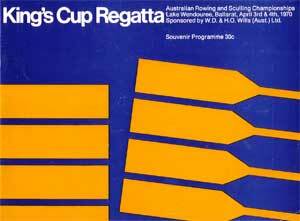 This was also a great race with SA narrowly winning from NSW and a dead heat for third placing. This was SA's first victory in this Championship.